Braids are experiencing a major comeback, partially because many public figures like entertainers or television characters are rocking them. It’s fair to say modern men are always looking for new ways to express themselves. Although the philosophical question of reactionary activities arising out of conservative times is an interesting one, we will save that discussion for another time. 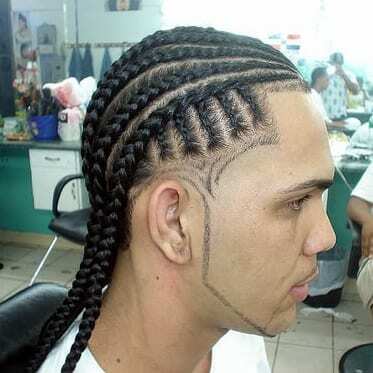 Instead, let’s focus squarely on some of the hippest braided hairstyles for men that have surfaced in recent years. We’ll also explore how you can incorporate them into your personal style. One great thing about braids is that they serve as practical a purpose for men as they do for women. Although short hair has been part of the repertoire of modern masculinity for at least a century, there have been times when long hair was just as common for males as females. Perhaps it is the images of these men of former times in movies and television that has inspired this increased interest in braided hairstyles. Our culture is clearly drawn to men like the characters on the History Channel’s Vikings, shows that take place in various Dark Ages, and shows based in fictional settings like Game of Thrones. Braids can be great for guys, but there are some things a man will have to take into consideration before he embarks on his braiding journey. If braids were easy to get and maintain, then perhaps everyone would have them. In truth, there are many things to consider when thinking about getting braids, especially if you are a man. Although braids can help manage long hair by tying it into place, braids also require care. You should also consider the time it may take to create a more elaborate braided hairstyle like box braids. 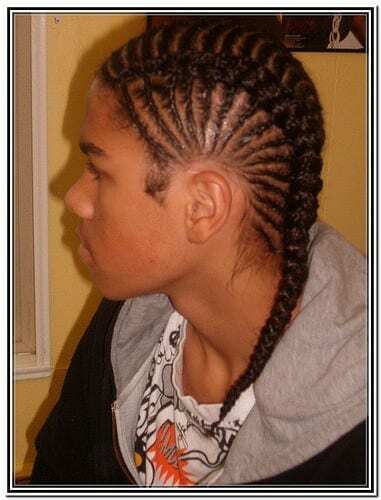 First, there is a great variety of braided hairstyles, several of which we’ll discuss here. Some braided hairstyles are pretty simple, like the simple plait or twin pigtails, but remember that simplicity is relative. For someone with thick or difficult to grow hair, successfully achieving even a simple plait may represent a serious challenge. The point that we are making here is that there are several things to take into account when choosing a braided hairstyle for yourself. The aesthetic appearance of the style, and how you will look with it, are just two factors. 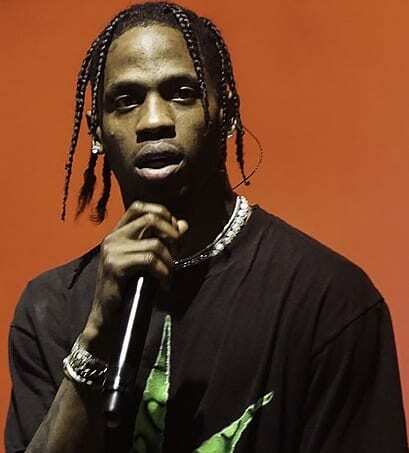 Braids are sported by many men in the public eye today from Ragnar Lothbrok to A$AP Rocky, representing a wide range of styles, cultures, and hair textures. 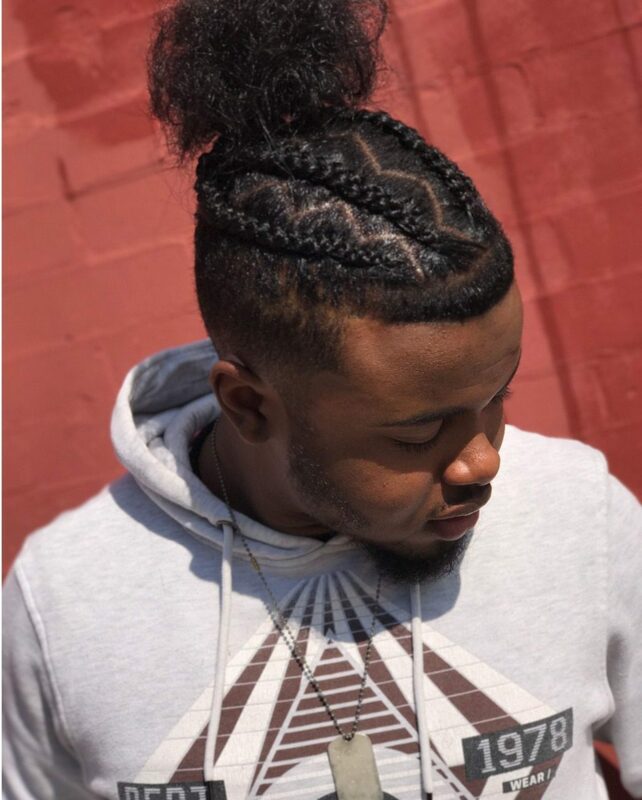 Here are some things you may have to think about when considering braided hairstyles for yourself… or even to suggest to a male friend. 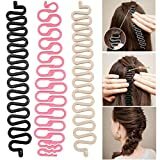 Hair thickness is an important consideration because certain braid styles may be difficult, if not impossible, to achieve with very thick hair. 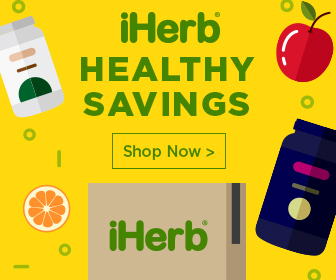 One option is to find a product that effectively changes the thickness or texture of your hair. Braids can work with hair of different thicknesses, but there are limits. Hair type can be restrictive, especially if the hair in question is very dry or very thin and brittle. Although braids are doable on a wide variety of hair types, many suggest that hair that is curly or wavy is better for braids. We have said they should tell Ragnar Lothbrok, as he may have something to say. Hair length at the time you change styles also matters. Braids can work with some short hair, but some resulting styles may be less dramatic and eye-catching than those created with more hair to braid. 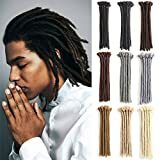 The layered form of braids is an example of this, as it allows the braids of men with shorter hair to take on an intriguing and individualized characteristic. Cultural appropriation is something to think about. It’s conceivable that someone may ask why, as you are not a Viking, why are you appropriating a Viking hairstyle. In our view, hairstyles clearly transcend culture to some extent. Besides, the Vikings have not been a legitimate force for more than 1,000 years, so we might safely tune their concerns out on this issue. Care and upkeep are major considerations for many men. Even though some people view braids as a way of not having to deal that much with hair (like when our moms put our sisters’ hair in pigtails), they actually require a fair measure of upkeep. 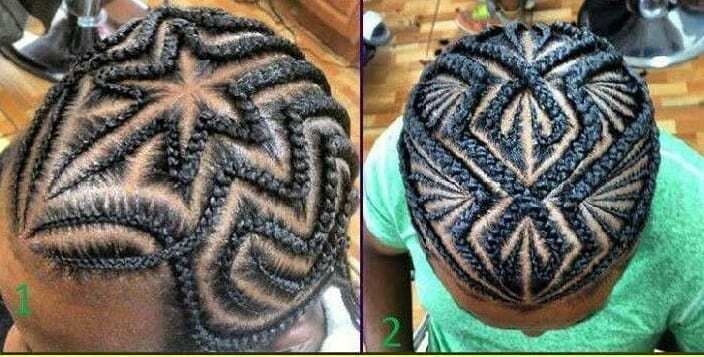 Depending on your hair type and how you would like your braids to look, you might have to put some thought into the effort required and whether you’re up to that. Cost is always good to estimate accurately. Although some braided hairstyles might be easily accomplished for free by a friend or significant other, some braided styles are intricate and will require a hairstylist who specializes in braids. This is something to think about if you are going for a flashier look. To explore this topic a bit further, let’s agree that braids can be both a convenience and inconvenience under different circumstances. There are several factors that come into play here. 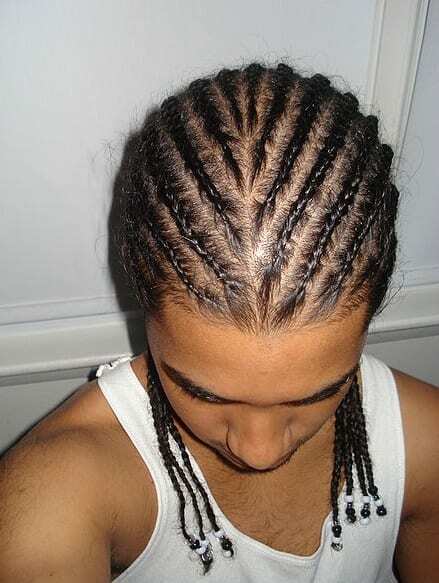 If you do not mind if your braids are a little disheveled, then you may not have to put too much thought or effort into upkeep, but if you work in a professional setting where one strand being out of place could cause a problem, then you will have to put some thought into how you plan to keep your cornrows looking fresh. Now that we have reviewed the in’s and out of braided hairstyles, we can jump into our discussion of the styles themselves. 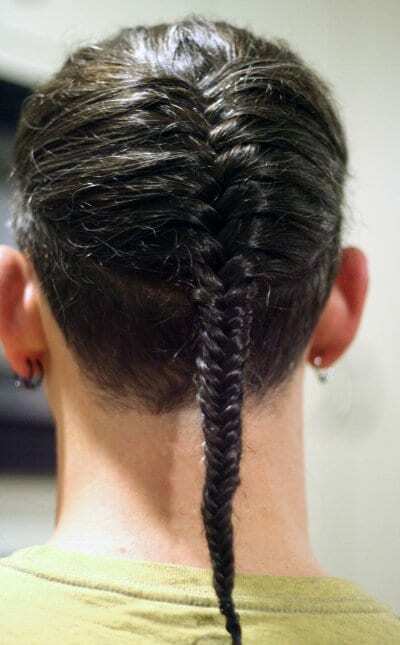 Although some styles may best lend themselves to differing hair types, men of all hair types have been able to sport a variety of braided hairstyles. A discussion of braided hairstyles would not be complete without an examination of the Viking braid. This hairstyle involves roping the hair into a long single braid and accompanying this strand with shaved sides of the head. 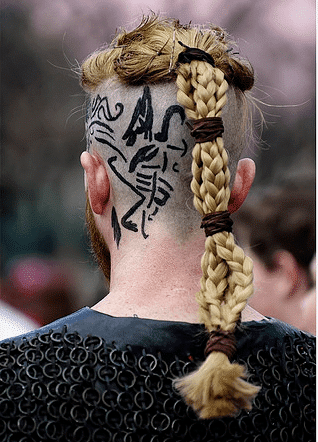 The Viking braid may involve a braid that begins high on the head, as opposed to the more traditional single plait, although there is some variation in how this braid is accomplished. This style is associated with longer hair. OK, we know that the single plait is mainly associated with children, but there is no reason why this version of a braided hairstyle consisting of a single braid must be relegated to kids. Indeed, the clean lines and relatively conservative look of this style may lend itself to those who work a nine-to-five. If you want to keep a single plait ultra-clean, though, you may have to braid your hair daily. The box braid is a very intricate style that usually involves augmenting thick hair types with hair extensions, ultimately creating a very dramatic style and look. This style may take some time to create, but that has not stopped adventurous men of the past, so why should it stop you? Layered braids are one of the more fun braided hairstyles because they leave some room for experimentation. This style may be an option for those with shorter hair, or just about anyone who wants to give it a try. Rather than a single braid in the back, this style involves many small and short braids layering down from the head, A$AP Rocky-style. Alright, so the infamous man bun has unfortunately been cursed by its association with wannabe hipsters or others who allegedly lack originality, but the “Braid with Bun” can strike out on its own. This style involves a braid that is loose enough that it can be twisted into a bun in the back, creating a style that is fun and exciting but demanding as far as upkeep is concerned. Cornrows are perhaps the “braid-iest” of braided hairstyles. This striking look can make an impression for those who want their facial good looks to stand out or just want to look a little edgier. This tightly braided style can require major upkeep for those with thinner hair. This list would be incomplete without cornrows. A hairstyle consisting of two pigtails can make you look like Heidi and her friends from, um… Switzerland? or Sweden? On better days, they can be edgy and provocative. If you are a budding provocateur, then this look may be for you. Braided hairstyles offer endless possibilities to the man who wants to leave an impression. A braid can express individuality, add a little flair to an otherwise conservative look, or just suggest to the observer that you have not left your youthful years behind. You can do anything with the right braided hairstyle. Now, the choice of which braided hairstyle is ideal is up to you. The post 7 Braided Hairstyles For Men appeared first on Men Hairstylist.